Winnie the Pooh has become one of the world's most beloved characters since his creation in 1924. And you can always find Pooh alongside his friends Piglet, Tigger and Eeyore! Each 8x10 inspiring print will look fabulous as framed decorative wall art in any child's bedroom. Get these adorable prints before anyone else! Our photos are developed on 100 year archival premium-grade paper in a rich gloss finish. GREAT GIFT IDEA - For any baby nursery or child's bedroom! 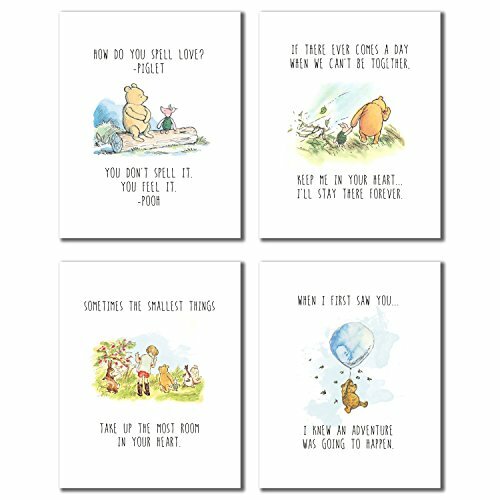 CUTE AND ADORABLE - Unique digitally produced watercolor poster prints of Winnie the Pooh and friends! READY TO FRAME - Set of 4 glossy photo prints, 8x10 - 8 inches by 10 inches. Choose the frames that work with your decor. If you have any questions about this product by BigWig Prints, contact us by completing and submitting the form below. If you are looking for a specif part number, please include it with your message.